The war on drugs is lost. No character in “Sicario” says as much, but the overwhelming thrust of Dennis Villeneuve’s gripping film makes that conclusion unavoidable. Taylor Sheridan‘s first produced screenplay couches its sobering observations within the familiar tropes of an anti-crime drama. 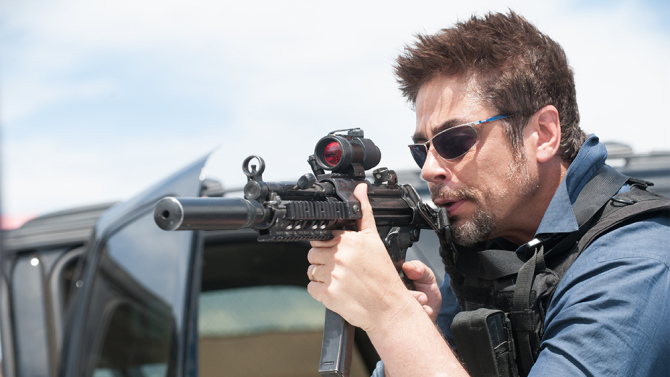 “Sicario” (Mexican slang for “hit man”) begins with FBI agent Kate Mercer (Emily Blunt) leading a raid on what appears to be an unremarkable home in the Arizona desert. Except that the house is filled with heavily armed men and contains dozens of dead bodies entombed behind dry wall — it’s like some sort of bizarre tract home catacomb. Kate and her partner Reggie (Daniel Kaluuya) are by-the-book types who make a point of observing all the legal niceties. So Kate is puzzled when she is reassigned to an interagency task force where the rules are bent or broken with disturbing regularity. She’s suspicious of Graver (Josh Brolin), the garrulous but vaguely sinister task force leader. She thinks he may be CIA — but that can’t be, since the CIA cannot legally get involved in domestic operations. And her red flags really begin twitching in the presence of Alejandro (Benicio Del Toro), who claims to be a former Mexican prosecutor but radiates lethal possibilities, not to mention an encyclopedic knowledge of the Mexican drug cartels they’re trying to bring down. “Sicario’s” knotted plot is hard to explain — it involves a massive plan to force one drug kingpin to reveal the identity of his heavily-protected boss. There are blatantly illegal incursions South of the Border, a kidnapping and torture — but the mood of desperation, corruption and betrayal that it establishes (abetted by a throbbing musical score that seems to embody doom) is carried with the viewers as we leave the theater.